Great Western Coffee Shop > All across the Great Western territory > Fare's Fair > Best ticket combo? I'm hoping there are a fare expert or two around this evening. Tuesday evening around 8 p.m. Bath Spa to Melksham. There is a Routeing Guide easement that allows passengers travelling via Yate to Bromsgrove to double-back via Birmingham New St. Just um, forget to double back. 700351 Customers travelling via Yate to Bromsgrove in possession of tickets routed "Any Permitted" may double back via Birmingham New St. This easement applies in both directions. I've said before that there's nothing written in black and white that disallows starting/ending short or breaking a journey at a station from where one is allowed to double-back. I've never had an issue with CrossCountry TMs or New St gateline staff when presenting a ticket to/from Bromsgrove whilst using the above easement. Only once queried by a TM who accepted without further question once I explained the easement. You're under no obligation to explain your actual journey - just say there's an easement that allows you to travel via Birmingham New St.
Tuesday Morning, Stourbridge Town - Birmingham Stns Anytime Day Single £3.45. Then on Tuesday midday start short at Birmingham New St on the return portion of the Melksham - Bromsgrove Off Peak Return, breaking your journey in Bath. Otherwise it's a Melksham - Birmingham New St Off Peak Return at £41.05 plus the above singles to/from Stourbridge Town. A Melksham - Stourbridge Town Off Peak Return doesn't really work as you can't travel via Brum with that. That's fascinating Bignosemac. Though how would someone trying to make this journey know that this fare even existed? I've put in a hypothetical journey from Melksham to Bromsgrove into National Rail and the only fare it offers me is a £78.10 single via Birmingham with no return fares available. Curiously it does offer a £21 single in the other direction. Do you know if there is anything similar coming from the Newport direction, or would someone taking advantage of this have to travel via Bristol Parkway? The easement states that you must travel via Yate with and 'Any Permitted' ticket. Newport to Bromsgrove fares allow that route (Newport - Bristol Parkway - (Birmingham New St) - Bromsgrove) and the walk up fares are all 'Any Permitted'. Because of the via Yate part of the easement you can't travel via Chepstow. You won't get booking engines to correctly show the easement even if you specify 'via Birmingham New St' in the options. It's one of those easements you just have to know about from years of studying the Routeing Guide. As even, Bignosemac, you are spectacularly good value. I was playing around with going in via Worcester and doing the loop - looking at Melksham to Old Hill which I think is valid both ways round. However, a Bromsgrove ticket might give me a return option that allows me to use a Cross Country express. Mind, I will have p-l-e-n-t-y of time between finishing in Birmingham and starting in Bath. I won't detail the suggestion that National Rail made ... suffice to say it was VERY much more expensive ... at least it came down to under £100 once the railcard discount was applied! I can save the walk across Brum and change at Galton Bridge, I think? BNM never fails to impress me with his ticketing knowledge. Thanks Bignosemac. But to come back to the question of how would I know such a fare to Bromsgrove exists (and more to the point, whether they exist from other stations, eg Bristol), if National Rail doesn't tell me, I can't buy it online, and I wouldn't know whether or not I could ask for one at a ticket office. It's as if they are hiding the cheapest fare. Do you see what I mean? The easement states that you must travel via Yate with and 'Any Permitted' ticket. Easements aren't meant to be used to get a cheaper fare to the double-back point. Unintended consequences that introduce legitimately exploitable loopholes. The Bromsgrove easement is there because of the limited journey opportunities from stations to the south of Yate to Bromsgrove. They are an imperfect solution to increasing journey opportunities though. As, for instance, as grahame notes, you can't travel from Melksham via Swindon and Stroud and use the easement under discussion due to its 'via Yate' requirement. From Greater Bristol/Bath and surrounding stations to Bromsgrove there are two walk up fare routeings. 'Not via Birmingham' and 'Any Permitted'. The latter allows the use of the easement to travel via Birmingham but those 'Any Permitted' fares between Bristol/Bath and Bromgrove are only a couple pounds cheaper than those to Birmingham. I agree that there are many easements that aren't correctly coded into journey planners and booking engines. Whether this is deliberate or oversight I know not. This Bromsgrove one is one of those that isn't coded. As a counterpoint though I can mention a Newbury easement that is coded. Travelling from Westbury and surrounding stations to Newbury, its allowed, via easement, to double-back via Reading. This potentially saves money on a trip to Reading if you *ahem* forget to double-back. From Grester Bristol/Bath and surrounding stations to Bromsgrove there are two walk up fare routeings. 'Not via Birmingham' and 'Any Permitted'. The latter allows the use of the easement to travel via Birmingham but those 'Any Permitted' fares between Bristol/Bath and Bromgrove are only a couple pounds cheaper than those to Birmingham. Could doing this be treated in some circumstances as "traveling short" which I gather you are not allowed to do or are we looking at two different things here? 16.4 Generally, you may start, or break and resume, a journey (in either direction in the case of a return Ticket) at any intermediate station, as long as the Ticket you hold is valid for the trains you want to use. However, this may not be the case with some through services that take an indirect route. You may also end your journey (in either direction in the case of a return Ticket) before the destination shown on the Ticket. Using a double-back easement means the station where you double-back becomes an intermediate station on your journey. Absent of any specific prohibition (and there isn't one written into either the Conditions of Travel or easements text) then starting/ending short there or breaking your journey there is permitted by NRCoT 16.4. I've never had serious issue breaking a journey whilst travelling and using a double-back easement. However, what I write here is not in any sense a legal opinion and such advice should be taken at your own risk. When using loopholes and grey areas its important that I point out that YMMV. Saying "bignosemac said it was okay" is unlikely to wash if you are challenged. Know the easement, know the Conditions of Travel, be calm, be confident... "There's a Rail Delivery Group Routeing Guide easement that allows me to travel via X. That's what I'm doing." Easements aren't meant to be used to get a cheaper fare to the double-back point. Unintended consequences that introduce legitimately exploitable loopholes. Thanks. I was thinking of the situation where someone actually wants to travel to Bromsgrove, and the system doesn't give the cheapest fare, and almost seems to go out of its way to not show it. Very unfare! Your comment about fares from Bristol not being as cheap got me researching. It looks as though an off peak return from Melksham is 30.50, but from Bristol it's 55.30. Is that correct? Is it allowed to buy a ticket from Melksham but only starting at Bristol? It's all very confusing, but the fare into Birmingham is so expensive that it's worth trying to understand what cheaper options are possible. Yes. 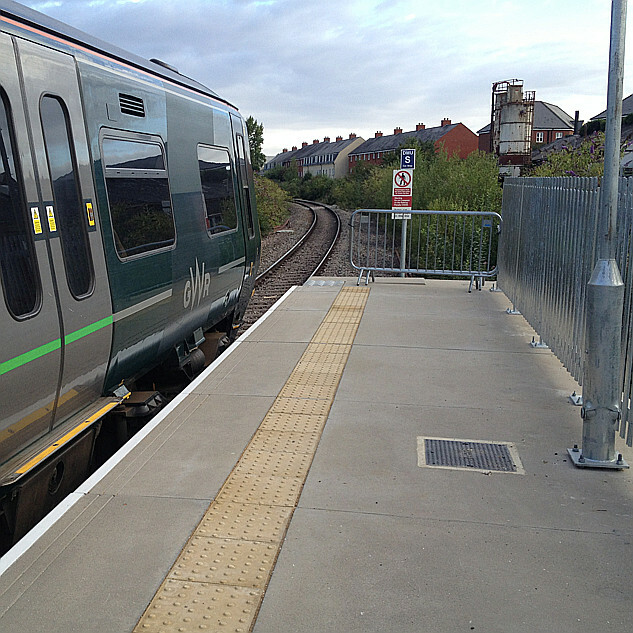 The fare from Melksham to Bromsgrove is valid to start short at Bristol. That's what I used to use on my day trips to Birmingham from Bristol TM. Then on to Bromsgrove of course. Don't forget to comply with any time restrictions. 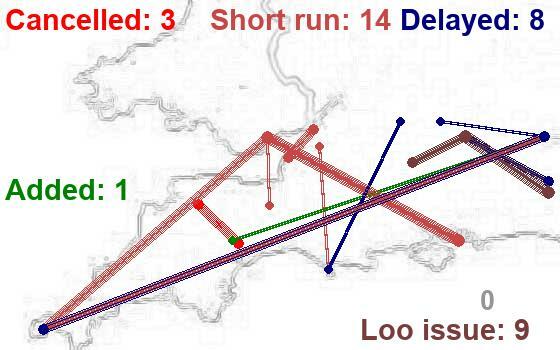 When starting short it's best to factor in the unused part of the journey, and not start from the intermediate station when it wouldn't have been possible to get there, from the origin printed on the ticket due, to a time restriction. Sorry to grahame and co. for skewing the Melksham passenger figures with my numerous trips to Birmingham that started from Bristol TM but had the origin of Melksham on the ticket. If that concerns you, you can instead chose Chippenham to Bromsgrove instead. Same fares, same easement. Time restrictions is another minefield isn't it? With Melksham having fewer trains than Chippenham it may be better to use the latter, although I think Melksham's need for more tickets is probably the greater. I'm sure I'm not the only one to find all this an eye-opener, although it is probably "old hat" to regulars on the forum. Thank you again Bignosemac. Looking back a few years, Melksham's ORR ticket sales numbers bore no resemblance to the actual passenger numbers and that was both a curse and a blessing. These days the distortions are much much less; I do wonder about how much the distortions are at stations commonly used for ticket splitting. And Melksham, thank goodness, is safe (and growing again now that there's space on the longer trains) in its real numbers. But by all means buy yourself a "Melksham Special" as fares are added to the fare system for you to buy, and thank you for the thought and the publicity it will bring. My final leg back on Tuesday will be by bus from Bath ... but I will be on a return train ticket from Melksham. Real victory in sorting out the system would be if I could use my train ticket on the First bus because the last First train had gone.